Glendale FWA has 22 ponds and 1,400 acre Dogwood Lake, as well as 8,060 acres of upland game habitat, marshes, shallow impoundments and small woodlots. Deer, quail, rabbit, squirrel, snipe, dove, woodcock, waterfowl, wild turkey, songbirds, red-tailed hawks, osprey and bald eagles can all be seen at Glendale FWA. 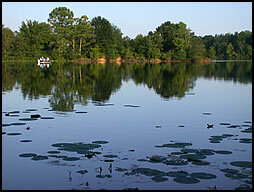 Dogwood Lake comprises 1,400 acres and has an average depth of 8 feet. After lake renovation it was restocked with fish in 1979. Primary species include catfish, crappie, bluegill, redear and largemouth bass. Boating - 2 concrete boat launch ramps on Dogwood Lake, plus a concrete launch ramp on Dove Hollow Marsh. Wren, Redwing, Big Piney, and Goose Ponds have gravel boat ramps. There is also 1 concrete launch ramp on East Fork of White River. There is a 10 MPH limit on Dogwood Lake; all other small ponds are restricted to paddles, oars or 12-volt electric trolling motors only. Camping - 67 Electric Sites ($18/night), 54 Non-electric Sites ($12/night) available all year. Sites can only be reserved if paid ahead of time, in person, at the park. Some campsites have fire rings. Firewood is sold at the boat rental concession. Comfort station providing heated showers and flush toilets is open from April 1 to October 31. Water fountains are open from April 15 to October 15. Fishing - Dogwood Lake has been stocked with catfish, crappie, bluegill, redear and largemouth bass. (Dogwood Lake will close to boat fishing one day prior to opening day of and remain closed during the waterfowl seasons. Shoreline fishing will be permitted in designated areas during this time.) The minimum size limit for largemouth bass on Dogwood Lake is 15 inches. There is a 14 inch minimum size limit for largemouth bass on all small ponds with one exception: NO largemouth bass may be taken from Dove Hollow Marsh. See posted signs. All other size and bag limits apply. All state and federal fishing regulations are in effect. (Set/drop/limb lines and trot lines are permitted in Dogwood Lake by permit only from the first Thursday in april to the second Wednesday in October. Permits are available at no charge in the check station during this time period.) There are no restrictions on the types of legal bait used. However, note that live gizzard shad and carp are not legal to be used as bait. Fishing Piers - 1 wheelchair accessible fishing pier on Dogwood Lake, 1 wheelchair accessible fishing pier on Horseshoe Pond. Wildlife Viewing - 8,060 acres of upland game habitat, marshes, shallow impoundments, a 1400 acre lake and small woodlots attract songbirds, red-tailed hawks, osprey, bald eagles and a wide variety of waterfowl. Deer, quail, rabbit, squirrel, snipe, dove, woodcock and wild turkey are also common at Glendale FWA.